This is an excerpt from my 2010 book, Living Life with Strings Attached. It’s a short little guidebook that walks through the Strings Attached Pledge and the development of covenant relationships. Enjoy! I love this quote from Job. Let me refresh your memory about the story. This particular verse actually takes place within the Epilogue of the story of Job. Job has been through (literally) Hell on Earth; he has been faithful, but prideful; he has questioned God; and he has seen the error of his questions and repented before the Lord. The Lord is angry with Job’s friends for speaking out against Him. He tells them to offer burnt sacrifices and Job will pray for them and that Job’s intercessory prayer will be heard. It is heard and Job’s friends are restored in the eyes of God. Job also, by praying for his friends, is restored. That’s wonderful! But the real question is: how often do you REALLY do it? Do you REALLY pray for them? I will be totally honest – I am preaching to the choir here! I have been really convicted of late to change this part of my Christian walk. First, you could simply say to the person you are talking to, “I would love to pray with you about that. May I pray with you right now?” If the answer is yes, well, then you know what to do. Sometimes, however, the answer will be no. Prayer is a very intimate experience and some people are simply not ready to share that with you. They may covet your intercessory prayers on their behalf, but they are not ready to be privy to them. This is ok, and it doesn’t mean that you can’t pray RIGHT THEN. Just take a moment alone, and lift that person up in prayer. Your moment doesn’t have to be long, but it does need to be intentional. I find that not only does praying for others encourage a life of “praying without ceasing it also helps me to remember the prayer requests of the people who I run across in my daily life. 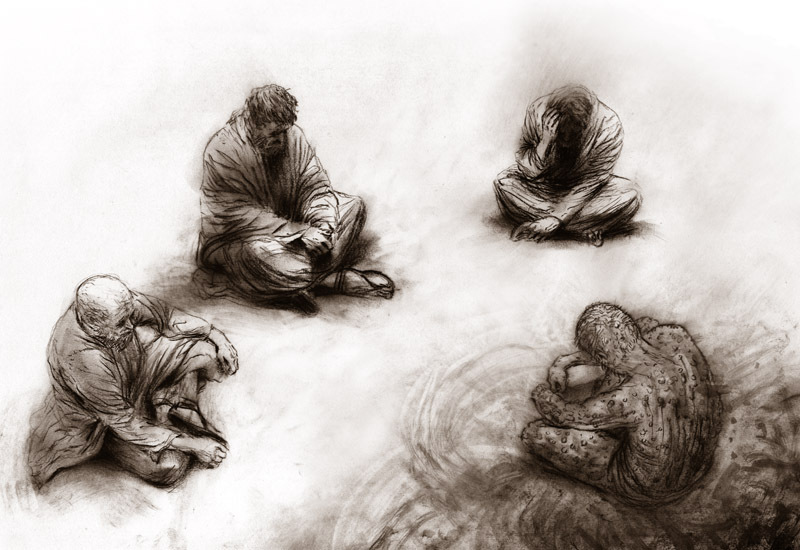 Thinking of the Book of Job, I often wonder at Job’s friends. They showed great loyalty by sitting with him. They sat for 7 days and watched their friend suffer. They debated and thought and tried to coach Job through a solution to the problem. Sometimes, perhaps they were not far from striking the theological truth. Sometimes, they were just plain ole wrong. But never once did they offer to do the one thing that all good friends should do. They never once offered to pray for Job. I wonder what would have happened if they had?